Here is a copy of an announcement of a conference at SOAS at the 15th August 2014 in London. Hopefully this is only a start of a series of discussions! I wonder which wardrobe Rabten will pick out for his role as “defender of the oppressed”- robes or civvies? I don’t see any Speakers (shugden practioners – especially Geshelas) presenting the case for shugden as an enlightened Buddha. That is the WHOLE issue!! I assume that will be included in Geshe-la’s talk but rather maybe as a side track. You don’t see why that’s important? yes, i don’t see that. Sorry, I lost the thread of the discussion … I deleted the reply which didn’t match your question. Why is it so important to know that Rabten is behind this site? Do you think he is the “independent journalist currently based in the UK” that firms as IndyHack? This could be the case. Maybe then this is a good question. But I fear he won’t answer truthfully. Of course its a good question. Isn’t it a fair guess that Rabten runs http://arebuddhistsracist.com? It would be better to ask Rabten, what his view on Tibetan self-immolation is and the role of the Dalai Lama in that regard, confronting Rabten with his wrong statements he made in his videos (quoting some of them) and then to ask Prof Mills as a researcher and anthropologist what his views on this issue are. Then it becomes obvious that Rabten is a nut case in what he is claiming. It would reveal that he holds extremist and fundamentalist, wrong views that do not accord with reality but with his fantasy only. I think this would be useful. But it needs some preparation and quotes he made otherwise he might to want to fiddle around. A reasonable person with some good questions, maybe this could awaken him a bit. It will be in all ways interesting because there will be a clash of reality. I just realized that this event is only going to go for two hours. Is that right? That seems barely enough time for the greetings and well-wishes. How on earth are five such speakers going to get anything significant achieved in two hours? That this is just the first in a proposed series of roundtables. Each speaker talks for 10 minutes. Then there are open questions from the floor and the moderator chooses who should answer them. It might be good that people go there and prepare some questions. NKT will do what ever they can to appear there as “independent Buddhists”, “neutral observers”, “impartial observers”, “independent journalists” or “concerned Buddhists” in order to establish their imagined reality as fact. Here they also denounce Martin Mills and Thierry Dodin.. I hope someone asks Rabten about that website. The debate about Human Rights is useful. Martin Mills investigated it extensively in his 2003 paper (which is now online). What the “independent journalist”, IndyHack (quite likely Rabten) totally misses is the knowledge of a Tibetologist, historian, anthropologist and the capability to reflect and to see his own bias. He himself is of course also not a human rights expert (not to speak about IndyHack’s qualification as a journalist where there is not any proof that he has any qualification or worked as such) but IndyHack is quick to draw conclusion that all academics he lists on this website are not qualified to speak about Human Rights, and his own “qualification” tells hims that the “Dalai Lama may be sued in the US and how International human rights laws apply to this issue.” He ignores the fact that the India Delhi High Court rejected in 2011 to even start a law case due to lack of evidence. Now the US will do it? The Shugden conflict started when there were a lot of problems in the Gelug monasteries. Traditionally, in such cases the Dalai Lama (who is seen as their spiritual leader) is asked for the reasons and what to do. This is a very long established tradition and a commonly accepted procedure. When he investigated he found out that the problems derive from Shugden practice. Fearing to upset some he addressed the cause in a rather indirect way (not mentioning Shugden explicitly) but then Shugden people started to lie and to claim things that were untrue (like after the Dalai Lama said that he gave up Shugden practice that he would practice it secretly). The Dalai Lama discussed the issue at that time also with two Professors from the West and all three came to the conclusion that a ban is unacceptable and no solution. On the one hand, the Dalai Lama was asked and is seen as the spiritual authority whose spiritual advice is commonly accepted, on the other hand Shugden people couldn’t accept his advice and the relating back of trouble in the monasteries to Shugden. From the very beginning, the Dalai Lama stressed, that individuals can practice Shugden. On the institutional level he recommended to stop it and finally via the Stick Referendum (which is a procedure according to the Vinaya) the majority of the monks in the monastery voted against Shugden practice in their places. (Of course, it is more complex and there are more things to be considered here.) The key point is that there are restrictions at certain places/institutions (in the case of the monasteries based on majority vote) and that there is freedom to practice it individually and at other places (like the own Shugden monasteries). Its the right of every religious institution to ban practices they see as wrong. Its the right of every spiritual leader to advice against certain practices. The rights of the individual have not been violated because Shugden adherents can practice it (and they do). The problem is rather, that Shugden practitioners are shunned by the society. This is very sad. And the causes for this situation lies (in my eyes) on both sides. However, the NKT Western Shugden movement only contributes to make the things worse, there is not any constructiveness. The CTA or the Dalai Lama, however, could state in public that it is a violation of civil rights if certain shop owners exclude (by their own will not because the CTA asked them) Shugden followers from buying in their shops. It is overdue to ease the tensions and to make some reasonable moves that pacify the situation in India. The list of Tibetan Shugden protesters who attended the recent anti Dalai Lama protests at the CTA website is a step backward and not forward. I hope the SOAS series will contribute to a better understanding or some constructive ideas and actions. I hope that copies of IndyHack’s tar and feather articles against Prof. Mills, Hayden, Thierry Dodin and all are printed and given to them during the panel discussion, so they can directly respond to the silly allegations. These articles also demonstrate that the NKT has already written off the dialogue, so is not entering into in good faith. Not a proper basis for the negotiation and agreement they claim to be seeking through their increasingly hysterical protests, claims and propaganda. I have also heard that John McBretney wanted to attend the SOAS talk, and in fact also wanted to be a panelist, but the NKT had to choose one and in the end they picked Rabten. The Saffron-robed Muslim? NKT Religious Discrimination Revealed! I have just uncovered a copy of the original NKT protest booklet, that was handed out during the 2008 protests in England. 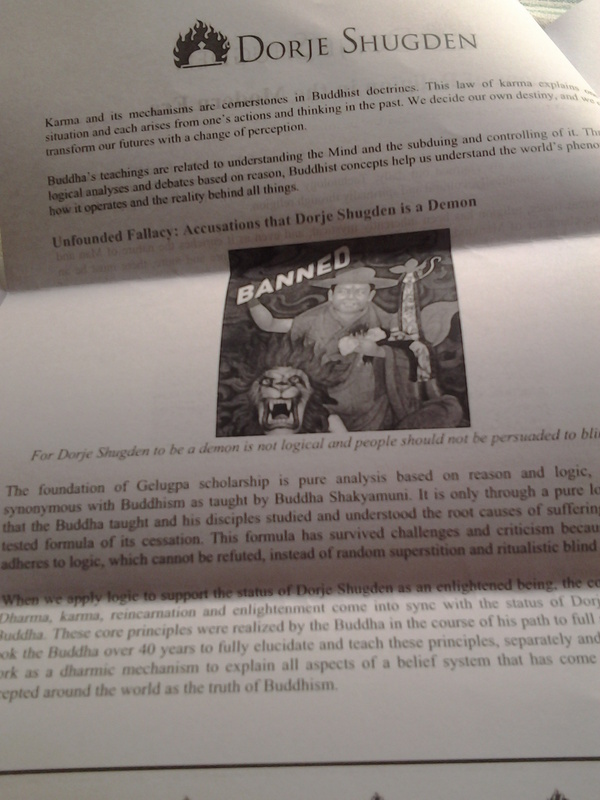 Surprisingly, this PDF was still tucked away in the files of the western shugden society website. There was no longer a link to this PDF from the main page, but through some clever use of google I was able to find it. The NKT are saying that the Dalai Lama is not a real Buddhist and that he is actually a Saffron-robed Muslim. This is very offensive to His Holiness, and also to all Muslims as their religion is being used as a derogatory name for His Holiness. This is not the behaviour of sincere Buddhists to speak such words, and it is disgraceful. I have already made a copy of this ebook and it will be uploaded elsewhere on the internet, so there is no point in the NKT taking it down, if you are reading this any NKTers. I have not put words in your mouth, this is a direct quote from your ebook, which is authenticated by the fact that the very link is from your own protest website. The list of speakers for the SOAS event has now changed, I guess NKT insisted on having more panelists. So John McBretney is now a panelist. Someone please ask him about his racist remarks regarding Muslims, and why he used allegations of Muslimhood as a way to attack the Dalai Lama. I wonder again, if any dialogue with them is possible. How can dialogue be possible with individuals who intentionally deceive? 1) one offers fringe theorists (ICS/NKT Rabten & McBretney) a public forum and makes them acceptable on the society level. 2) The videos and material ICS spread demonstrates that they are not able to dialogue but issuing forth aggressively distorting propaganda – the material is demagogic (!) and the material is skilfully twisting facts. So far not any scientist has taken responsibility to investigate their material and to untangle this propaganda and usually scientists don’t pay attention either too much on such material. 3) The ICS will use the panel as a platform for their demagogic propaganda and it is questionable if it is really possible to guide that meeting. 4) The conference gives the self-acclaimed importance of an anoymous(!) group weight – maybe too much weight. 5) In an academic institution non academic material can be propounded. I don’t know, the conference seem to be well intended but maybe also quite naive. With respect to the “false Dalai Lama” talk by Rabten, this is laughable at an university. With respect to McBretney’s and the ICS’s claim of “the suffering of Shugden people” and human rights abuses, actual this is a denigration of the REAL suffering of those whose human rights are abused and who are tortured, murdered, imprisoned, killed etc. Not any Shugden person has been tortured, killed, imprisoned, they can freely travel, get their passport documents, they have access to the Indian court, they can sue the CTA, they can sue the Dalai Lama (and they tried and the court refused their claims); they have access to schools and education. Not any of these rights are denied. In some cases civil rights have been violated but there is no policy by the CTA to impose such. The NKT/ICS are a highly aggressive, self-serving propaganda group, that exaggerate the own sufferings that are laughable in the light of the real sufferings of so many in this world. Never ever has the NKT and their front groups, like the ICS, engaged to do anything that is not related to them but really out of concern of the suffering of others that do not belong to the own idendity. The whole campaign is therefore a real expression of a group narcissism, that can be promoted and staged now at the SOAS. Tenzin, I totally agree with all your points. As an FYI to everyone, I have started a blogsite on all of this. I have observed the Shugdenpas tactic of putting their point of view on many online venues, in order to give a perception of it being widespread, so I thought it would not hurt to have some repetition on our side. 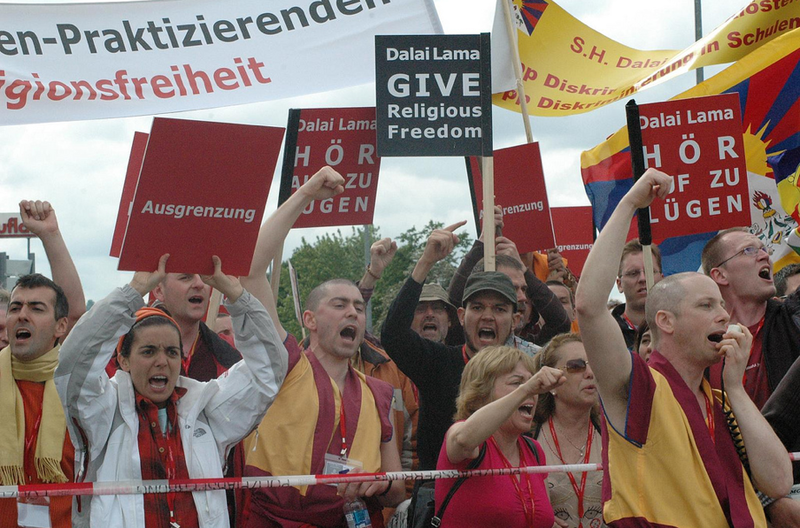 My intention is only to address the campaign against the Dalai Lama– particularly to expose the deceit. So any contributions are welcome! The web address is http://www.dalailamabigtruth.com So far, I’ve only put up one blog, which is a dressed-up version of something I’ve already posted here. Tulkus are almost never the literal rebirth of the previous person. It seems only clueless westerners take it literally. The famous picking of the objects by the Dalai Lamas is purely ritualistic. Dudjom Rinpoche, for example, attained rainbow body. So how can a Buddha have a rebirth? There are bardo procedures for anyone to be reborn as a tulku. That’s mean you and I can be reborn as tulkus. There are some changes in the format. The participation in discussion will be timed and held only between the speakers on the panel. There will be NO QUESTIONS FROM THE AUDIENCE. I think that change of the structure is well done and contributes to a constructive atmosphere. Reting Rinpoche versus Taktra Rinpoche and more – Turbulent times just before Communist invasion. The two sides of New Kadampa Tradition and Gen Kelsang Rabten – NKT-IKBU National Spiritual Director for New Zealand and Australia who is currently residing in Hong Kong as the NKT’s Resident Teacher of Kadampa Meditation Centre Hong Kong. Gen Rabten is a pure disciple who has trained under the guidance of Venerable Geshe Kelsang Gyatso for more than fifteen years. His deep faith in Kadam Dharma and the sincerity of his practice are deeply entwined within his teachings, inspiring many people to embark on a meaningful and rich spiritual life. The whole discussion will be recorded and publish on YouTube http://www.youtube.com/user/LondonNey/videos. You can subscribe to this channel, so you will be notified when they are uploaded and ready for watch. When I picture Rabten standing up there in front of adults, in front of academics, so that he can provide “research” proving that the Dalai Lama is not the Dalai Lama, my mind just shuts down– it feels like watching one of my kids’ plays when they were in a really bizarre, silly mood– except in this case, no one will be laughing. I imagine a sort of stunned silence will greet him when he’s finished, as if to say, Are you for real? Maybe someone has a good sense of humor. How true, Tenpel: I imagine a group of 400 or so Dalai Lama supporters facing demonstrators, with a megaphone of their own, and just laughing. That’s all, just laughing. Loudly. It makes me giggle just to think about it. Its a bit like in the school; the attention goes to those who are the noisiest and most aggressive. The ICS’s dominance in this matter is coming from the attention by the media and based on their highly professional and expensive media campaign and protests. And the media attention is derived from the fact that the ICS/NKT people are surfing in the wind shadow of the fame of the Dalai Lama. Its just too attractive to the media, “spectacular” 😉 Now, if the NKT/ICS dominate the debate whom do you think people will invite to speak? The NKT had the chance to appoint a Tibetan Shugden practitioner to the SOAS conference but because they are not truly speaking for Tibetans they nominated two of their own people. I do hope there will be follow-up SOAS panels. Next time, I would hope that the moderators would stop the presenters if they veer off their stated topic. I was unhappy that Rabten was allowed to change the subject, so to speak. But isn’t that the way propagandists operate? Lie, deflect, mislead, change the subject, and control. The NKT always seeks to control the conversation, no matter where it takes place–in the centers, in the street, on the internet. Fortunately, there are more and more people speaking out against their propaganda, and will continue to do so. Well said. Well said. I totally agree.